The reason I am sharing this photo out of the Sprague Lake Walk album is that as we were walking around Sprague Lake, we came across a pair of geese. They mingled along the side of the trail and did not mind us that much. We continued down the trail and thought we left the geese behind. Not exactly! A little ways farther down, they came swimming along and we noticed that a goose from the other side of the lake [the one in the photo] was getting agitated. Needless to say, they honked at each other for a little bit of time. This goose finally decided the other pair was getting too close and wanted to chase them back. I think it is an interesting photo because the goose was so focused on chasing the other pair of geese away that it literally crossed in front of my dad within about 5 feet! 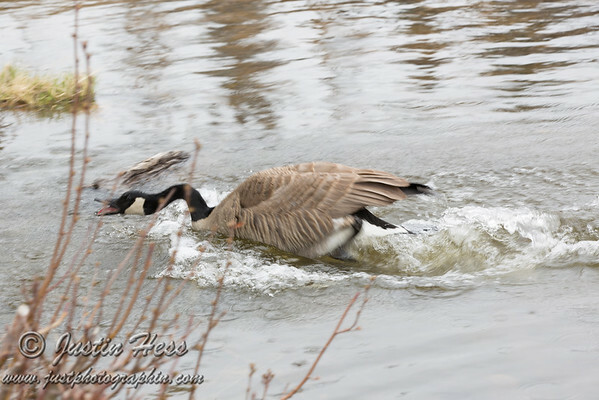 I captured more photos of the geese, and they can be viewed in the gallery: Sprague Lake Walk 5-18-2013.